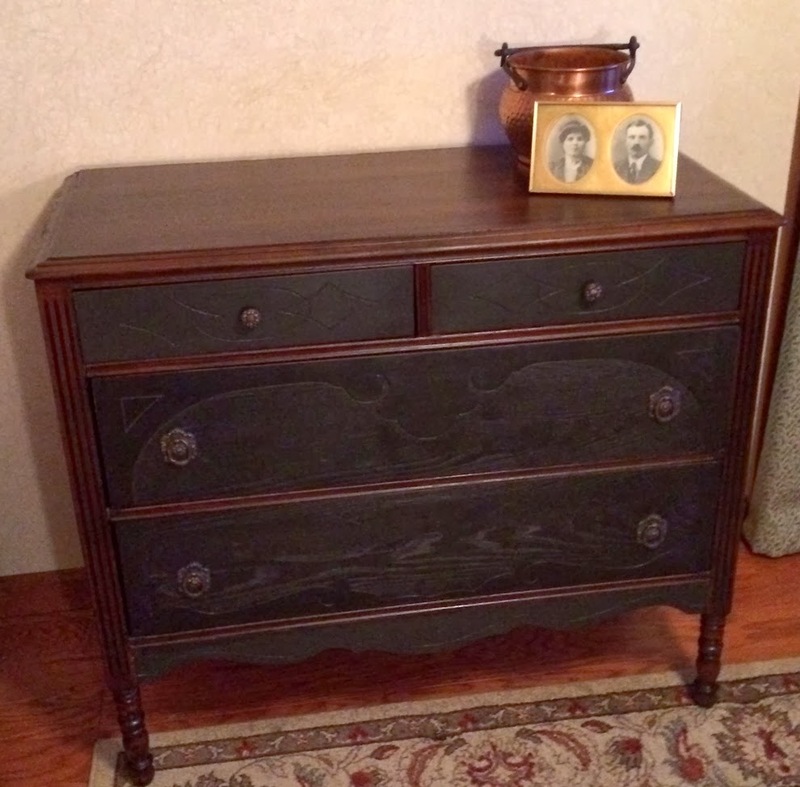 A few months ago I picked up a matching dresser and chest at a yard sale. They had been used and abused but the price was right and there was hope. I don't have a before photo of the chest but it was in the same condition as its mate. I finished the rehab on the chest a few weeks ago and decided to go in an entirely different direction for this dresser. Some of the veneer needed to be removed from the drawer fronts and the body of the dresser was sanded to remove the old finish. 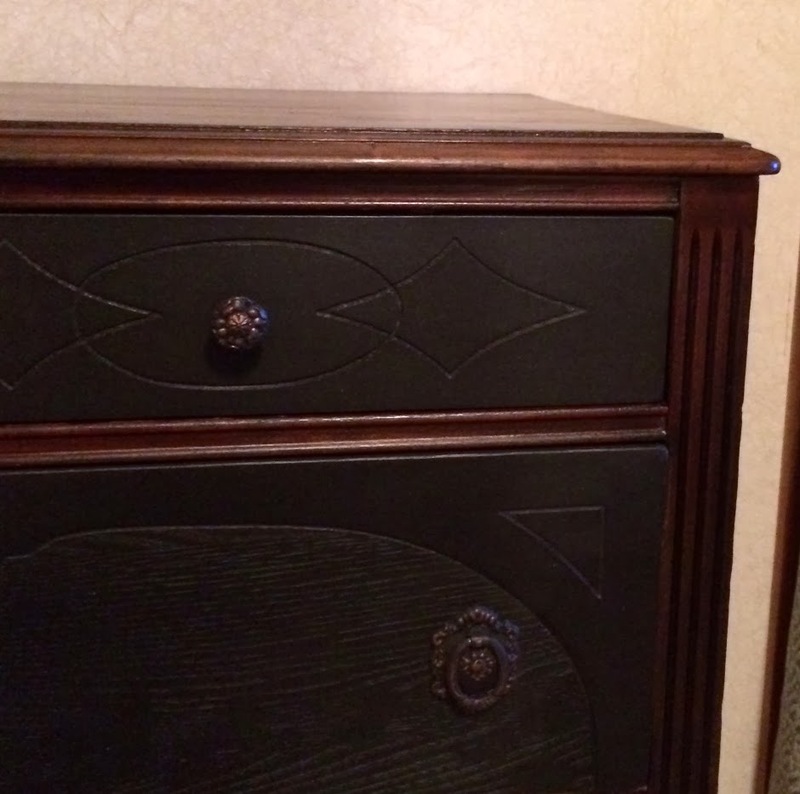 The drawers are painted black with hm chalk paint (Ben Moore's Aura in Onyx). The cabinet was restained with Minwax Espresso. I kept the original hardware, painted it matte black then dry brushed with some copper bronzing powder in a glazing medium. The drawers are hand waxed with APC's dark wax and the cabinet received two coats of Minwax Polycrylic. I really like the way it came out; unfortunately I can't keep it! Let me just say that I love estate sales! They are my second favorite place to find neglected or abused furniture (first, of course is curbside). This forlorn little bench seat was sitting over in the corner and absolutely no one was paying any attention to it. Okay, it was scratched and the upholstered seat was a mess but the joints were tight and it was solid. Turns out, it originally had a caned seat and when that broke, a previous owner had made this upholstered seat. Great idea but once the upholstery job started to go, they must have said, "enough!" I've been using a lot of black recently, so I decided to stay with it a little while longer. The bench is painted black and the upholstery is black, which gives it a dressier look. I then offset the dressy look by distressing some of the wood and using a knotted jute trim tied for the tufting. What do you think? This drop leaf end table was an interesting(?) shade of brown. It has great detail and a lot of versatility, so it was a great candidate for rehab. I sanded the top down to bare wood and scuffed up the rest of the table. Black is always a popular look and it brings out the great details, so it got two coats of homemade black chalk paint, some distressing and then two coats of polycrylic for protection. Was it worth saving? Say 'hello' to Bourbon St.! This oak storage cabinet was in excellent condition - it just needed an update. Since it was in such good condition, a painted cabinet wasn't really the look I was going for. So, I lightly sanded and restained the box of the cabinet using Minwax Espresso (I think this may be my new favorite! ), giving it a much deeper & richer finish. Then, I painted the door with homemade chalk paint using Benjamin Moore's Ruby Red. For some reason, I couldn't get Bourbon St. out of my mind, so I used the French version! I lightly distressed the door and typography and followed up with Fiddes Wax in Rugger Brown. The box has a protective coat of Polycrylic. Now that it has some personality, wouldn't it make great storage in a kitchen or bathroom? So, now that the holidays are over, it's time to get back to work! There are several pieces in my "stash" waiting patiently for their rehab, and this sad, dated table was one of them. Although it's a very sturdy, well-made, piece, it's obviously past its prime! Even though it had been badly neglected, the top of this table has great detail and I wanted to bring that out. I decided to avoid bringing more attention to the base of the table - there's enough going on there without trying to emphasize any of it! So, when a lady wants to appear slimmer - what does she do? She wears black, of course. I carefully sanded the top to remove just the old finish but still keep all of the detail, then stained the top with Minwax Dark Walnut. The black base was waxed with Minwax Paste Wax and the top is protected with two coats of Minwax Antique Oil Finish. After some light distressing, this table is ready for a new home!